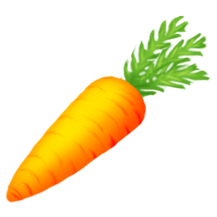 Carrots are a crop unlocked at Level 9. They grow on field plots by planting a previously harvested (or purchased) carrot plant. Each plot yields 2 plants (net gain of 1 plant) and takes 10 minutes to mature. It gives two experience points when harvested. Carrots can be used to make pig feed and goat feed as well as five different dishes and one drink (carrot cakes, carrot juice, carrot pies, fish soup, pumpkin soup, Noodle soup, shepherd’s pies and veggie lasagna). They can also be used to feed bunnies, donkeys and horses, in order to get extra experience points and bonus supplies.